The best technology that helps you to secure flavor-preserved solventless oil! Innovative design that makes extraction simple, safe, convenient, and affordable! 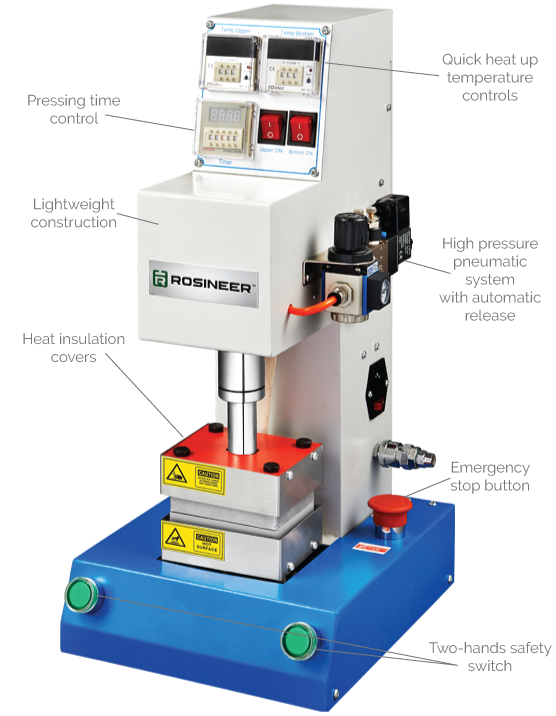 Rosineer RNR-PV1 & RNR-PV2 presses utilize heat and high pressure to create a solvent-free oil product that rivals hydrocarbon extractions in aroma and medicinal efficacy. Innovative Lever Design Pressing rosin is fun and easy when you start with Rosineeer manual machines. Thanks to our innovative engineering, you can apply a little force to the lever to get the maximum pressure and obtain a high yield at relatively low temperatures. Durable & Light-Weight Our machines are constructed of durable steel, but they weigh only a half of other manual heat presses. They are portable, compact, and occupy a small space when in use or storage. Simple, Safe, & Affordable These heat presses are affordable, simple, and safe to use in even an ordinary small lab or household environment and require no professional expertise in the field of botanical extractions. RNR-PV1: AC power cord, spare fuses (2), screw tools, user's guide. RNR-PV2: AC power cord, screw tools, air compressor cable, user's guide. Ideal for home / personal use, the manual press is easy to operate and does not require an air compressor or any other accessories. With compressed air as the power source, the pneumatic press machine eliminates the need to use manual force and makes pressing rosin highly efficient. Non-sticky, easy to use and clean 9-piece tool kit allows you to gather and store oil extract effortlessly. three (3) non-stick silicone jars. Founded in the fall of 2014, Rosineer Technologies is an engineering company offering an extensive range of equipment, accessories and innovative process solutions that based on advanced technology and a real knowledge of the plant extract industry. We at Rosineer understand the need of our customers who are under increasing economic competitive and regulatory pressures, and we partner with them to design and deliver the most reliable, efficient, innovative, and cost-effective solutions for the process and overall project implementation.